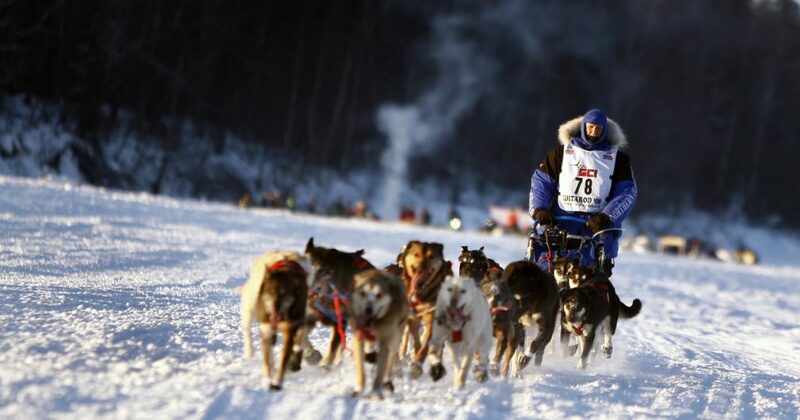 If there is one event that defines Alaska it is the 1100-mile Iditarod Trail Sled Dog Race from Anchorage to Nome. It pits men and women and their dog teams against the wilderness, subzero temperatures, blizzard force winds, whiteout conditions, wind-chills of -100 degrees and all the other nasty surprises that Mother Nature can cook up in the dead of the Alaskan winter. Approximately 65 teams will begin the race each with a maximum of 16 dogs and the logistics of moving the tons of food and supplies to checkpoints along the route are very complicated. 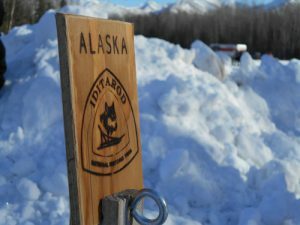 The Iditarod began in 1973 as an event to test the best sled dog mushers and teams but evolved into today’s highly competitive race. The festive “ceremonial” start of the race is in downtown Anchorage on Saturday March 3rd at 10:00 am. The real start of the race is 70 miles north in Willow Lake on Sunday March 4th at 2:00 pm. The teams will start at intervals a few minutes apart and clock in at checkpoints for required rest breaks. Veterinarians will examine the dogs to make sure they are managing the race in good health. The musher who completes the 1100-mile race and arrives in Nome in the shortest elapsed time wins. The all-time record for the fastest time is held by Mitch Seavey, who finished the race in 2017 in eight days, 3 Hours, 40 minutes and 13 seconds. Alaskan women also compete in the Iditarod. Libby Riddles was the first woman to win (1985) and subsequently the late Susan Butcher won the Iditarod 4 times (1986, 1987, 1988 and 1990). Libby Riddles is known to lecture aboard the Princess Ships when they stop in Juneau during the summer cruising season. The participants obviously do not do it for the money. It costs a minimum of $50,000 to enter the race. In 2017 the purse for the top 30 finishers was $750,000. The winner received $75,000, and the payout for the others in the top 30 ranged all the way down to $2,025.